Our family has read lots of books together over the years. There are certainly some books that we can't wait to be done with, there are others that you wish would never end, and then there are the few and rare books that capture not only a moment and a story with drama and excitement, but also add insight to insight and prompt you to live life more richly. 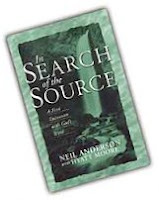 The Blue family gifted us with such a book at Christmas time: In Search of the Source. In Search of the Source is a true account of a missionary family's work among the Folopa people in Papua New Guinea. Neal (author) and his wife, Carol, were among the first foreigners to learn the language of the Folopa and then translate the Bible into their native tongue. While the story line seems potentially mundane, this book is a story of the extraordinary and is quite simply fascinating. What would it would be like to have, once again, a first encounter with God's Word? This book does a swell job of answering that question.